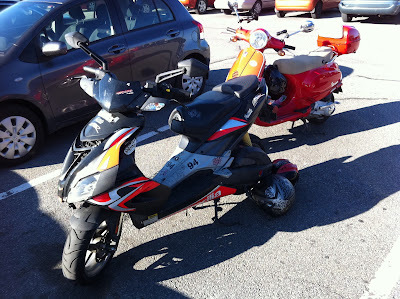 Eventually you will want to park your bike somewhere, and not want to schlep your helmet along for your stroll. If you wear a half helmet or perhaps a three-quarter helmet, and if your pet carrier or top case are relatively empty, you can store your helmet there and it will be out of sight, protected from the elements, and reasonably secure. If your helmet doesn't fit there, you'll need another strategy. Then again, maybe your helmet would fit there, but, like me, you carry other stuff in those places (rain suit, tool kit, portable air compressor, locks, digital camera, Sham-Wow, RAM mount accessories, monocular spy scope, ear plugs, flattened beer can (indispensable for soft ground to support the stand), air pressure gauge, Iphone charging cable, bungee net, GPS unit, re-usable shopping bags, sunglasses, velcro strap to compress the rear brake when the tire needs air, Icon waterproof gauntlets, and other sundries), and then you won't have room for a helmet, or much other stuff. Sheesh, I sure do carry a lot of stuff. I'll have to have another listen to George Carlin's inspirational riff on 'stuff'. You could just lock your helmet to the back wheel, like these brave souls do (I don't know them, I just parked next to them at the mall). 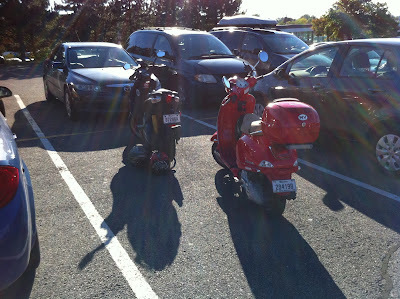 One plus of this strategy is that if a thief takes your scoot, those helmets will smack his leg with each turn of the stolen wheel. But sitting on the ground like that seems a little inelegant, not to mention that you might get an earful of ants and spiders when you pop your lid back on. 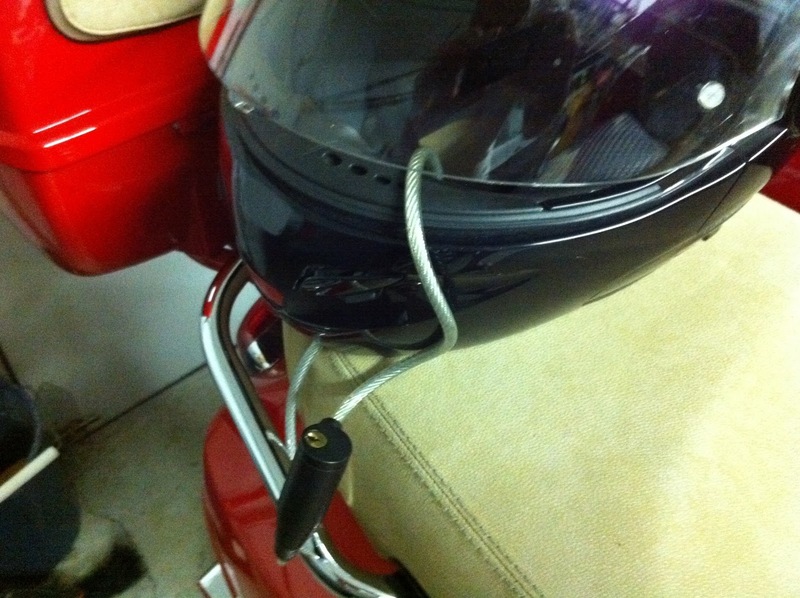 If your helmet strap closes with a double D-ring, like a horse saddle cinch, Vespa's got you covered. It's easy to overlook this tiny feature under the saddle, just at the lip of the pet carrier, on the starboard side, at one'clock. If you still can't spot it, this picture may well be worth a thousand more words. Once you close the saddle, the helmet hangs securely from the chin strap. You might think that the strategies I've covered so far are the only ones you'll need to secure your helmet. Well, if your helmet is a full-face helmet, and if it has a nice ratchet closure, like mine, then you're still out of luck. I'm glad you asked. It took me a while to figure it out. 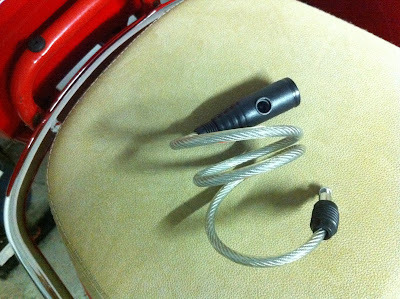 I picked up a short cable lock at the Montreal Harley Davidson + BMW dealer. I close the chin-guard on my Nolan N102 helmet, thread the cable lock though the visor opening, pass the cable through the grab rail, and close the lock. I lower the visor, then sit the helmet down on the saddle, up against the topcase. The nice thing about this strategy is that if it rains while you're off running errands, the inside of the helmet stays nice and dry. Wait! You say you have an open-face helmet with a ratchet closure? You're still not out of luck. You need to get a T-bar thingy specially made for the Nolan ratchet closure helmet. 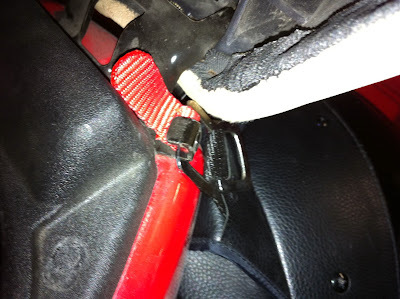 You thread it through the ratchet, then slip the hole on the T-bar onto the under-seat helmet hook, and close the seat. There you have it, six sure-fire strategies for securing your helmet, before you set off for a walk in the park. One handy alternative to the $10 Nolan T-bar thingie is to slip a small adjustable crescent wrench through the D-ring. Works for the helmet and may come in handy when you need it as a tool. 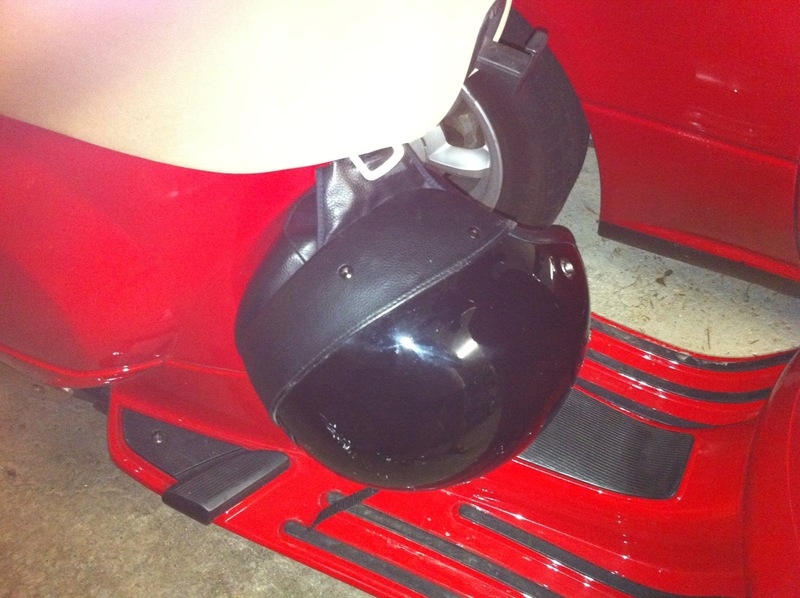 My preferred helmet lock is made by BigPantha. This one is lightweight carabiner combination lock with a nice long cable (180 cm). Means that I can attach both my helmet as well as my wife's helmet at the same time to my motorcycle! here it is - http://goo.gl/GP342u. And also as it's made from aluminium and zinc it won't rusted (unlike others that I've used).